Join the EBOOST 30-Day Fitness Challenge to “Feel Great, and Do More!” Transform yourself with this FREE & effective program to create a stronger, leaner, more fulfilling life. After the 30 days, submit your before and after photo to our Facebook page for a free box of EBOOST. The 30 Day Program consists of 5, 20-minute total body workouts led by our 5 fitness trainers : PJ Stahl, Danielle Pascente, Jake Ferre, Kate Abate and Jennifer Cassetta. Each workout consists of dynamic strength training and fat burning cardio drills that will rev up your metabolism, increase endurance and strengthen the entire body. Using plyometric drills, strength conditioning and core strengthening exercises this program will burn mega calories and create a strong, lean, healthy body. The 30 Day Program is designed to be modified to fit any skill level by adjusting resistance, reps, and rest periods. Be sure to have your EBOOST Natural Energy Booster before each workout, not only will it give you energy but it will keep you hydrated and provide you with the vitamins necessary to achieve desired transformational results. Click here to see the videos in the FREE 30 day workout Program! Complete the EBOOST 30 Day Fitness Challenge and submit your before and after photo to our Facebook page for a free box of EBOOST! Click here for an EBOOST Special Offer and check us out on Facebook, Twitter, and Instagram. 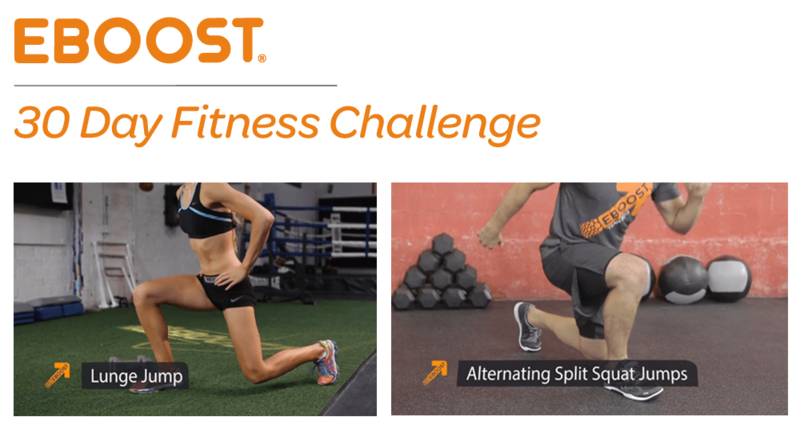 Join EBOOST for the Fitness Holiday Challenge!